Plan your perfect wedding, at home or abroad. Planning a wedding doesn't have to be hard work. 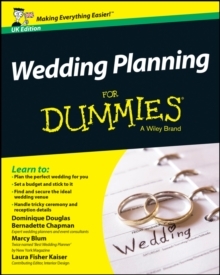 Take the pain out of the preparation and let Wedding Planning For Dummies help you design your dream wedding day - while saving time and money! Whether you're planning a traditional church ceremony, a quiet family celebration or a romantic destination wedding, this book offers all the budgeting tips, essential checklists and more that you need to make sure your special day runs smoothly. Content includes: * Budgeting for the big day. * Keeping it legal - getting all the legalities in place in plenty of time. * Preparing a guest list - who to invite, and where to draw the line. * Planning the schedule for the day, and any surrounding events (next day brunch, weekend plans). * Advice on choosing your dress, photographer, music, flowers, cake, wedding rings and more. * Destination weddings - the pros and cons of taking the plunge abroad.